The supply of logs for coastal sawmills has been shrinking in more ways than one in recent decades. Not only has the annual allowable cut on Crown land dwindled over the past 15 years by about five million cubic metres, partly through the creation of parks and conservation areas, but the size of logs has been shrinking too, as most of the large old-growth and second-growth trees get used up. Retooling mills to process smaller-diameter logs is expensive, and so are logging costs on the coast, so there has been a lack of investment in new sawmills on the B.C. coast. One recent exception is San Group Inc., which is investing more than $70 million in a new mill in Port Alberni. It will not only provide new sawmill jobs, but also provide the nearby Catalyst Paper Corp. mill – which Paper Excellence is acquiring – with wood waste. San Group, based in Langley, already has a mill in Port Alberni, which it bought from Coulson Manufacturing. It makes a range of specialty wood products, like engineered cedar siding. The San Group’s new sawmill will be able to process smaller, low-grade logs for use in engineered wood products. The company hopes to have the new mill operating by late summer. It will result in 50 new jobs, with up to 200 as the company adds additional phases to the mill, including finger joint and laminating plants. The mill will be able to process logs from four to 14 inches in diameter, which means small logs that would be useless for anything except pulping will be used in engineered wood products. That includes low-value hemlock. Sanghera doesn’t like to see B.C. logs shipped overseas and sold back to Canadians in products manufactured in places like China. He supports any effort to keep more logs in B.C., although he’s not entirely sure if the provincial government’s new strategy for reducing log exports will be all that effective. “Anything is better than what we’re doing right now,” he said. 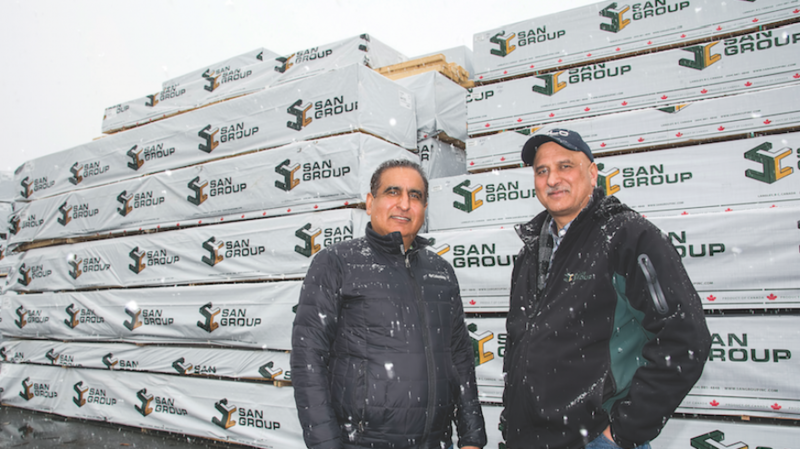 The lack of logs for smaller mill operators has been blamed on a shrinking annual allowable cut (AAC), but Sanghera said there is adequate AAC on the coast; it’s just not being fully used. He said much of the Crown tenure is concentrated among a few big companies, some of which have invested heavily in the U.S. in recent years. “Our timber licence is in a few hands … and those companies are spending hundreds of millions of dollars across the line,” Sanghera said. “They’re not investing money in Canada. But they are holding all our natural resources, and government is not doing anything to stop that.